First published in 1985. 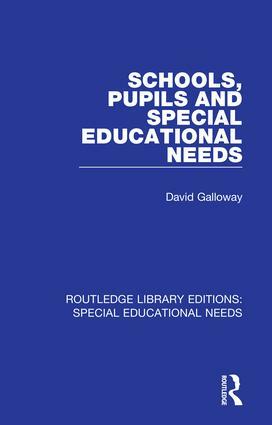 This book examines in-depth the administrative, curricular, attitudinal and pastoral care changes that are needed if teachers in ordinary schools are to meet their pupils’ special needs successfully. Drawing on extensive research the author shows that the needs of a minority of ‘special’ pupils cannot sensibly be seen in insolation from those of the other pupils in the school. Schools that cater successfully for the majority of their pupils with special needs. Conversely, the curriculum and organisational problems in some schools create tensions which are reflected in the pupils’ poor behaviour and performance. These are taken as evidence that the pupils have special needs.